I am one of the leaders for our church Young Women groups, so I get to interact with the girls not only at church, but every Tuesday for the Young Women’s activity. During one of our weekly activities we decided to teach the girls how to make spring rolls! I had no idea how to make them (someone else had the recipe) so I was really excited to learn about it with the girls! The spring rolls we made were filled with all sorts of vegetables, such as carrots, bell peppers, cucumbers, and avocados, as well as rice noodles. We had a peanut sauce for dipping the spring rolls. I loved the rolls and decided to step out of the box a little. What else could I put in a spring roll wrap? Well here is my innovation! It is an Asian Salad Spring Roll. If you have never made spring rolls before, or used the wraps, here is a little tip I discovered. 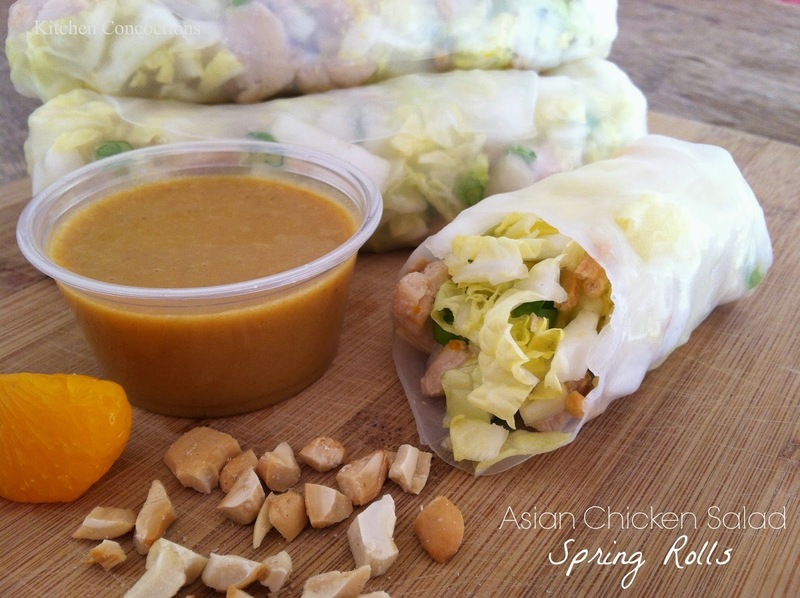 When you first make the spring rolls, the wraps will be a little rubbery. If you try to bite them they will stretch like some weird relative of silly putty. In order to avoid this, refrigerate your rolls for a few hours, or over night, and the wraps will transform into the perfect texture. Also, your first few rolls will be a little lose, and might not hold together very well. But keep practicing, and I promise you will get better! Cut the chicken into small cubes. Heat the oil in a frying pan over medium-high heat. Add the chicken, ginger and Maggi. Saute until the chicken is fully cooked. Allow the chicken to cool. Put the cabbage, mandarins, green onions, cashews, snow peas and cooled chicken in a large bowl and toss. Preparing each spring roll: Fill a cookie sheet with warm water. Put wax paper on the counter and lightly sprinkle with water. Place one spring roll wrap in the cookie sheet water, and rub your fingers across the surface. When the wrap has become soft and has the texture of aluminum foil, remove it from the water and place it on the wax paper. If the wrap becomes too soft (more like plastic wrap) it will be very difficult to work with. Put about 1/3 cup salad filling onto the center of the wrap. Fold the side of the wrap closest to you, just beyond the filling. It helps if you use this step to tighten the filling into the wrap, by pulling it slightly toward you with the folded over edge. Fold each side toward the center and then finish rolling the wrap closed. Place each wrap in wax paper for storing, so that they don’t stick on anything (or each other) and tear. Refrigerate for 2-3 hours, or overnight, for best serving results. Combine all the ingredients in a blender and blend until smooth. Store in an airtight container in the refrigerator.